Are you smelling something “off?” We understand where you’re coming from and if that smell is something you’re unfamiliar with, call Rowell’s Service today to diagnose the smell and to determine if it’s something that needs immediate attention. Smoke testing is an effective means of detecting openings in sewers that allow rainwater runoff to enter the system, potentially causing sanitary sewer backups. 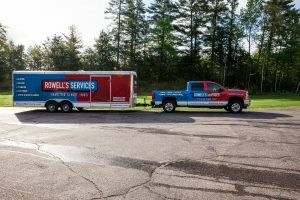 At Rowell’s Services, we offer smoke testing services in Northfield, New Hampshire, and the surrounding areas, and we can detect leaks without tearing up your entire lawn. The way it works is simple: A combination of air and non-toxic smoke is forced into the sewer line. The smoke can be seen coming up out of the ground in any areas where there are leaks in the line or faulty connections. With smoke testing, there is no need to dig up the line to look for problems. This means no damage to your property. When a leak is detected, we are often able to fix it using trenchless sewer relining techniques. At Rowell’s Services, the smoke we use is completely non-toxic and poses no risk to you, your family, your pets or even your houseplants. If any smoke enters your home, it will not stain clothing, furniture, etc. The smoke is not flammable. Sewer systems are designed to transport wastewater to treatment facilities. There usually is no problem during dry weather, but heavy rains can be problematic if leaks are present. When rainwater runoff leaks into the sewer, the system may not be able to handle the increased flow volume. When there is more water in the line than the sewer system can handle, disgusting backups can occur. Smoke testing is affordable, and it’s an effective method of detecting even small leaks. It is also fast and allows technicians to test large sections of sewer system quickly. Rowell’s Services offers smoke testing for main sewer lines and service laterals that connect to individual homes. To learn more, call 603-934-4145.